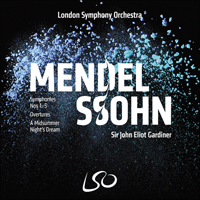 LSO Live presents Sir John Eliot Gardiner’s award-winning Mendelssohn series together in its entirety for the first time. Captured over three seasons during critically acclaimed concerts in the Barbican Hall, this set offers listeners the definitive account of Gardiner’s unique take on Mendelssohn with the London Symphony Orchestra: a blend between the conductor’s wide-ranging expertise and the orchestra’s signature sound. Felix Mendelssohn was the grandson of the Enlightenment philosopher Moses Mendelssohn and son of an influential German banker. Born into a privileged, upper middle-class family, as a boy he was encouraged to study the piano, taught to draw by his mother and became an accomplished linguist and classical scholar. In 1819 he began composition studies with Karl Friedrich Zelter. His family’s wealth allowed their home in Berlin to become a refuge for scholars, artists, writers and musicians. The philosopher Hegel and scientist Humboldt were among regular visitors, and members of the Court Orchestra and eminent soloists were available to perform the latest works by Felix or his older sister Fanny. Young Mendelssohn’s twelve string symphonies were first heard in the intimate setting of his father’s salon. Mendelssohn’s maturity as a composer was marked by his Octet (1825) and concert overture to Shakespeare’s A Midsummer Night’s Dream (1826). In 1829 Mendelssohn revived Bach’s St Matthew Passion exactly one hundred years after its first performance. Soon after, a trip to London and the Scottish highlands and islands inspired the overture, The Hebrides. In 1830 he travelled to Italy at the suggestion of Goethe and whilst in Rome started his so-called Scottish and Italian symphonies. In 1835 he was appointed conductor of the Leipzig Gewandhaus, greatly expanding its repertoire with early music and works of his own, including the E minor Violin Concerto. Two years later he married Cecile Jeanrenaud and in 1843 he founded the Leipzig Conservatory. His magnificent biblical oratorio, Elijah, commissioned for, and first performed at, the 1846 Birmingham Musical Festival, soon gained a place alongside Handel’s Messiah in the affections of British choral societies and their audiences. He died in Leipzig in 1847. With his meticulous craftsmanship and formal balance, Mendelssohn stands as one of the most Classically-inclined of the major nineteenth-century composers, yet he was also prone to moments of Romantic spontaneity. This was certainly the case when he visited Scotland with a friend in the summer of 1829: in July they were at Holyrood Palace and Mendelssohn was getting ideas for a symphony; and on 7 August a visit to the Western Isles had the composer writing home that ‘in order to make you understand how extraordinarily the Hebrides have affected me, I have written down the following which came into my mind’. ‘The following’ was the opening 10 bars of the ‘Hebrides’ Overture. But this was a holiday, and Mendelssohn was not in Scotland to write music. The day after his letter he took a boat trip to the Isle of Staffa ‘with its strange basalt pillars and caverns’, and it was not for another year and a half that he completed his Hebridean work (in Rome! ), entitling it Die einsame Insel (‘The Lonely Isle’). Revisions followed—Mendelssohn, fighting to reconcile the Classical and the Romantic, was worried that it tasted ‘more of counterpoint than of train oil, seagulls and salt cod’—and the version of the overture as we know it now, with its dual title of Die Hebriden (‘The Hebrides) and Fingalshöhle (‘Fingal’s Cave’, after Staffa’s best-known landmark) only emerged in 1832. Mendelssohn’s original thematic idea remained as the work’s opening, its gently rolling melodic outline and atmospheric accompaniment surely conjuring as instant a vision of the sea as its composer could have hoped for. Its melancholy falling six-note motif dominates the ten-minute work, a warm and shapely rising second theme first heard on cellos and bassoons notwithstanding, and undergoes a number of mood-changes. A storm blows up briefly in the central development section, but calm is soon restored, especially in the second theme’s restful return on clarinet, before the coda raises a final squall, again quickly quieted. Mendelssohn came from a cultured family versed in art, literature and philosophy as well as music, so we can take it that when he declared Victor Hugo’s play Ruy Blas to be ‘detestable’, after being asked to write an overture and a song for a Leipzig production of it in March 1839, it was not just because he was squeamish about the high body count. Set in 17th-century Spain, the play told the story of Ruy Blas, a servant cynically tricked by his master, Don Salluste, into impersonating a court grandee and wooing the Queen, who had scorned Salluste but whom Blas loves. When Salluste reveals the truth of Blas’ low birth in an attempt to compromise the Queen and thus gain revenge, the humiliated Blas kills him and takes poison, though not before the Queen has declared her love. For all its subsequent high standing in Hugo’s output, the play had been only a moderate success at its premiere in Paris five months earlier, and the Leipzig staging was given in aid of the local Theatrical Pension Fund. Mendelssohn originally agreed only to write the song, but in the end relented, apparently piqued when it was suggested that he could not write the overture in the admittedly short time allowed. In the end, he turned it out in just three days. The result, as ever with Mendelssohn, is brilliant in manner and skilful in construction, though the carefree energy of much of it seems strangely at odds with the subject. Only the swirling, febrile C minor music of the first theme and, above all, the noble opening wind chords that open the work, and return several times to punctuate the course of the movement (a dark counterpart of the ‘magical’ chords of the A Midsummer Night’s Dream overture of 13 years earlier), seem to betray apparent inspiration in Hugo’s grim tale. Seven years later Mendelssohn, already the composer of a brilliant overture to Shakespeare’s play A Midsummer Night’s Dream, produced a new overture based on two poems by Goethe: Meeresstille (Calm Sea) and Glückliche Fahrt (Prosperous Voyage). The overture as a form had only recently escaped from its original theatrical function into a new concert-hall existence as a short descriptive piece, and Mendelssohn evidently found plenty to inspire him in Goethe’s contrasted verses. Though he was not the first to have been so moved (Beethoven had made a choral setting of the poems in 1815, and Schubert had set Meeresstille as a song that same year), his treatment has become the best known. The subject of 'Calm Sea' is not the smooth surface friendly to sufferers of seasickness, but rather the torpid, windless conditions which, in the age of sail, rendered a ship depressingly immobile. Goethe even refers to a ‘fearful and deathly stillness’, depicted by Mendelssohn in a sombre adagio, only sluggishly agitated by contrapuntal undercurrents. Eventually a solo flute raises a breeze, the mist clears and after a rush of orchestral excitement the vessel is underway to a heroic, Beethovenian melody. There follow passages of plain sailing (‘the zephyrs are whispering’) interspersed with the nimble activity of the sailors, until, to welcoming fanfares and timpani cannonades, land is sighted. The voyage is over, and the overture ends with a contented sigh of relief. It’s not every evening that you get to hear a symphony by a fourteen-and-a-half year-old genius. And there’s an intriguing complication to this particular piece: it concerns the third movement—the Minuet. Well, I looked over my symphony and—Lord!—the Minuet bored me to tears, and it was so monotonous and pleonastic. So, what I did was to take the Scherzo from my Octet for strings, and I added a few airy trumpets, and it sounded absolutely lovely. Well, in truth he did quite a lot more than just adding a few airy trumpets: he re-orchestrated it with brilliant writing for the winds, while retaining the mercurial lightness of the original version. It’s so good we thought you should hear this new version of the familiar Octet movement. But what about the original Minuet and the Trio? Is it really so bad and so boring as Mendelssohn would have us believe? If so, why, when he came to publish the symphony, did he put that version in the score and leave out the Scherzo? Well, as you might have guessed, you’re going to get two for the price of one. I think both versions are really remarkable—as, indeed, is the whole symphony—and perhaps you would let us know at the end which version you prefer. The 15-year-old Mendelssohn entitled his Symphony in C minor ‘No 13’ when he produced it in 1824, a sign that he initially considered it to be next in line in the sequence of twelve accomplished so-called ‘string symphonies’ he had composed over the previous three years. But it is not just the presence of wind instruments that placed it in a different category from those childhood works and resulted in the eventual initiation of a new numbering sequence. This is a symphony on a higher level of assurance; though audibly derivative at times of Mozart, Beethoven and Weber, its verve and construction show astonishing ability for a composer of such tender years. The first movement bursts with energy, C minor not signalling tragedy (as in Mozart) or dark turbulence (à la Beethoven), but bracing urgency and drive. And while the melodic material is not greatly distinguished in itself, the main themes are expertly delineated, the handling of their sequence of statement and return deftly handled. It is followed by an andante in which the main theme’s comfortable major-key harmonies bring a warmly idyllic feel, though one that gains a certain restlessness from the way it is varied on each return, as well as from recurring syncopated murmurings in the strings. For the third movement the teenage Mendelssohn originally wrote a driving C minor Menuetto with a contrasting central Trio in which woodwind swayed gently over lapping strings. But for his first visit to London in May 1829—when, now all of 20, he directed the Symphony himself at a Philharmonic Society concert—he substituted his own orchestral enlargement of the brilliantly mercurial and individual Scherzo from the string Octet he had composed in 1825, a year after the Symphony. The reception was enthusiastic, and afterwards Mendelssohn—embarking on what would be a lastingly warm relationship with British audiences—presented his autograph copy of the score to the Society, who went on to perform it in this altered form for the rest of the century. Mendelssohn, however, restored the original third movement when the Symphony was published in 1831. In this performance John Eliot Gardiner presents both versions side-by-side. If, after these quintessentially Mendelssohnian movements, the concluding con fuoco finale starts out sounding like the finale of Mozart’s G minor Symphony (K550), there is both originality ahead in the way the music slows to admit stalking string pizzicati over which a slender clarinet melody emerges, and skill in two adroitly assimilated fugues. The genesis of Mendelssohn’s warmly brilliant ‘Italian’ Symphony could not be more straightforward. In the autumn of 1830, the 21-year-old composer undertook a tour of Italy, visiting Venice and Florence before wintering in Rome, where he began work on a symphony celebrating the sights and sounds of the south. ‘It will be the jolliest piece I’ve written so far’, he wrote back to his family, adding that it had driven the ‘misty mood’ of the ‘Scottish’ Symphony (the response to a previous holiday, on which he was then working) right out of his head. The work was completed on his return to Germany and premiered in London in 1833. Like Berlioz, who was in Rome at the same time, Mendelssohn saw little to admire in contemporary Italian music: ‘Why should Italy still insist on being the land of Art’, he wrote back to his family, ‘when in reality it is the land of Nature, delighting every heart? No lack of music there; it echoes and vibrates on every side’. A sense of Nature’s coursing energy certainly seems to drive the opening, memorably propelled by pulsating wind chords and a surging violin line of Italianate athleticism and grace. The vigour is maintained throughout this first movement: a second theme (given by the clarinets and bassoons) is mellower but cut from the same rhythmic cloth, and the central development section introduces a tripping new melody on violins, using it to build a climax and later returning to it after the initial themes have been reprised. The solemn march of the second movement is said to have been inspired by the sight of a religious procession (Berlioz included a similar ‘Pilgrims’ March’ in his Harold in Italy, composed four years later). Mendelssohn’s evocation consists of an austere and hauntingly coloured melody over softly padding string accompaniment, but there are two episodes of warmer, more pastoral music, as if the onlooker were momentarily distracted by beauties of the landscape. On both occasions, however, the pilgrims regain the attention, and the movement ends with them disappearing into the distance. The third movement is a classical minuet, albeit not so called and with a Romantically-tinged feeling of wistful nostalgia and a still central section whose gentle horn blasts recall the magical forest world of Mendelssohn’s own music for A Midsummer Night’s Dream. Italian music at last makes its mark on the finale, though it is not Rossini or Bellini whose genius presides but instead the folk dance known as the saltarello. By the summer of 1831 Mendelssohn had moved on to Naples, and it was there that he witnessed this energetic leaping dance. His symphonic recreation of it is Germanic for sure—witness the extended outbreak of casually worn counterpoint mid-way through—but it is spirited and hard-driven, providing a suitably exhilarating end to this celebration of Italian life and light. That Mendelssohn’s ‘Lobgesang’ (Hymn of Praise) is also known as his Symphony No 2 shows what an odd work it is. The composer himself was uncertain how to classify it until he took the advice of a friend and designated it as a ‘symphony-cantata’, a recognition of the fact that, if it has the overall trajectory of a four-movement symphony with vocal ending, then that choral ending—itself divided into nine sections comprised of arias, duets, recitatives and choruses—is so extended as to dwarf the first three movements altogether. Such a hybrid form has not always endeared it to critics, but this was a popular piece in the 19th century, and, as always with Mendelssohn, it is full of music of high quality and originality. The choral symphony was not an entirely new concept. Beethoven’s Ninth of 16 years earlier was the great precursor of them all, of course, but in 1839 Berlioz had produced an even more integrated and radical version of the form with Roméo et Juliette. The ‘Lobgesang’, however, owes its unusualness primarily to the fact that it was composed for a specific occasion, namely celebrations marking the 400th anniversary of Johannes Gutenberg’s invention of printing with movable type. Leipzig, where Mendelssohn had lived for the previous five years, had long been a leading German centre for books and printing, and had chosen to mark the quatercentenary with a three-day festival centring on the unveiling of a new statue of Gutenberg in the town square on 24 June. The day before there had been a new opera, Hans Sachs by Albert Lortzing, and the day after there was a grand concert in Bach’s church, the Thomaskirche, to conclude. As the city’s foremost composer and musician, Mendelssohn was invited to provide the unveiling ceremony with a cantata (Festgesang, where we get the tune known today as ‘Hark the herald angels sing’), and to conduct the final concert, which included Weber’s Jubel-Ouvertüre, Handel’s ‘Dettingen’ Te Deum and the premiere of this piece. No doubt mindful of Bach’s legacy, as well of the importance of the printed word to the spread of Protestantism, Mendelssohn had made use of Lutheran chorales in Festgesang. And for the ‘Lobgesang’ he determined on a large-scale symphonic work using both chorales and texts from the Scriptures. It was published as Symphony No 2 in 1841, despite the fact that the so-far unpublished Nos 4 and 5 had predated it. The ‘cantata’ section follows with a return of the motto theme driving an imposing crescendo, at the height of which the chorus enters and provides it with a text—‘Alles was Odem hat, lobe den Herrn!’ (All things that have breath, praise the Lord! )—before bursting into fugal exuberance. The next four movements—an urgent recitative and aria for tenor, a solemnly imploring chorus and a hopeful soprano-tenor duet—successively darken the mood, stressing God’s support in times of hardship, and reaching the lowest ebb in a dramatic tenor aria full of Romantic nocturnal anxiety (‘watchman will the night soon pass?’). Comfort comes right at the end of this section as the soprano declares ‘Die Nacht ist vergangen!’ (The night has departed! ), and the chorus takes up the line and turns it to light in another invigorating fugue. From here on the confident well-being of the opening is gradually restored, first with a pristine choral rendition of the Lutheran hymn ‘Nun danket alle Gott’ (which Mendelssohn had also used in the Festgesang), then with another duet radiant with thanks for deliverance, and finally a grand choral declamation and a fugue of Haydnesque jubilance. Although Mendelssohn never relinquished his concern for formal clarity and balance, he was not afraid to push at the envelope and, within certain limits, be innovative; indeed his instrumental compositions are those of a man constantly questing for new solutions to problems inherent in existing forms. But, as we have seen with his Hebrides Overture, he was not immune to extra-musical stimuli; brought up in a cultured family environment, from an early age he drew musical inspiration from Shakespeare and Goethe, and from landscape, legend and history. Perhaps few among his works accommodate the competing compositional interests of formal logic and evocative pictorialism more comfortably than the ‘Scottish’ Symphony. In the deepening twilight we went today to the palace where Queen Mary lived and loved … The nearby chapel is now roofless, overgrown with grass and ivy, and at the broken altar Mary was crowned Queen of Scotland. Everything is broken and decayed, and the bright sky shines in. I believe that today I have found the beginning of my 'Scottish' Symphony. Few symphonies have their moment of inspiration so precisely recorded, yet, having sketched the opening bars, Mendelssohn set this one aside, and it was left to the Hebrides Overture to stand as his most immediate response to the Scottish experience. By then he had fallen under another picturesque influence, caused by a visit to Italy which, he said, made it ‘impossible to return to my misty Scottish mood’; another symphony, the ‘Italian’ (No 4) now occupied him, and it was not until 1842 that he finally completed the ‘Scottish’. The Symphony opens with a lengthy slow introduction in which the Holyrood theme conjures gloomy and romantic tones, and it is largely on a restlessly lilting transformation of this that the subsequent main body of the movement is based—indeed, several of the themes which occur in later movements are related to this opening theme. Throughout the first movement stormy episodes (reminders of rough seas and bad weather no doubt) mingle with calmer passages, but, despite the opportunities presented by a robust central development section, it is in the long coda that the tempest really breaks. The movement ends, however, with an atmospheric return to the music of the introduction. Mendelssohn indicated that the four movements of the ‘Scottish’ should be played without a break, and thus it is that the scherzo-like second creeps in almost before you can notice it. This is the most overtly ‘Scottish’ music of the whole symphony, but its presence is brief, and soon we find ourselves in the Adagio, a yearningly beautiful movement in which a wistful song-melody is several times beset by passages of Schubertian menace before ultimately winning through, relatively unscathed. Mendelssohn gave the finale an additional performance indication of ‘Allegro guerriero’—fast and warlike—and if it does not seem to be exactly battle music, we can suppose that it reflects memories of another sight that impressed him, that of Highlanders in resplendent costume. The movement is full of ingeniously contrasted and combined themes, but the composer chooses to end not with a grand swirling climax, but rather, having slowed the music down, with a final, warmly comforting transformation of the ‘Holyrood’ theme. Thus, for all the work’s conscious Scottish-isms, formal coherence is effortlessly maintained. Despite its numbering and opus number, Mendelssohn’s ‘Reformation’ Symphony was actually his second for full orchestra, predating his ‘Lobgesang’, ‘Scottish’ and ‘Italian’ Symphonies. He began it in December 1829, just after returning to Berlin from his first visit to the British Isles, his intention being to use it to mark the following year’s 300th anniversary of the Augsburg Confession, the assembly which had defined the core beliefs of Lutheran Protestantism. A number of factors conspired to prevent it from fulfilling this purpose, however, and the symphony was eventually premiered in Berlin in 1832. It may seem odd that a Jewish-born composer should have chosen the Protestant Reformation as a subject, but religious tolerance had been strong in the Mendelssohn family at least since his grandfather, the philosopher Moses Mendelssohn, had helped Prussian Jews obtain social equality. What is more, Felix and his siblings were baptised into the Christian faith in 1816. There may have been a musical impulse for the work too: since his mid-teens Mendelssohn had studied and enjoyed Bach, including some of the vocal works that at the time were considered impractical to perform, and in March 1829 he had conducted the first performance since Bach’s day of the St Matthew Passion. Furthermore, he had himself composed a number of works based on Lutheran hymn tunes (or chorales). In this context, a symphony with a finale based on one of the best-known of all chorales—Ein’ feste Burg ist unser Gott ('A Mighty Fortress Is Our God')—must have seemed a natural enough progression. The first movement opens with a slow introduction in which slowly curling counterpoint and increasingly urgent fanfares lead to two ethereal renditions on high strings of a rising six-note figure known as the ‘Dresden Amen’. It has been suggested that this reference to the Catholic liturgy was meant to denote the old church beset by controversy, and certainly when the music plunges straightaway into the main body of the movement—now in the minor—it is with a sense of struggle and upheaval. At the end of the central development section the ‘Amen’ figure reappears, this time ushering in a recapitulation which is muted in tone, but which builds again to a stormy climax. The Scherzo is graceful and light-hearted, but though seemingly set apart from the general mood of the symphony—it is more bucolic than reverent—it retains thematic links with the falling woodwind motifs of the very opening. The solemn third movement is short, the feeling that it is at least half-conceived as an introduction to the finale reinforced by its recitative-like violin line. That finale opens with a warmly harmonised statement of Ein’ feste Burg ist unser Gott, the prelude to a sonata movement with themes of its own interlaced with occasional guest appearances from the chorale, the last of which brings the work nobly to a finish. Mendelssohn’s extraordinary early activity as a composer—twelve string symphonies, six operas, the astounding Octet for strings and much else besides by the time he was 16—went hand in hand with a cultured upbringing that left him well versed in matters literary and artistic. In addition to his musical activities he wrote poems, painted and drew, while his parents’ home in Berlin was one of Germany’s most active intellectual salons, where concerts, theatrical performances and literary readings were frequent and guests included scientists, philosophers, actors, writers and musicians. Felix found much inspiration in these experiences, and in the summer of 1826, while still only 17, was moved to compose an overture based on Shakespeare’s enchanted comedy A Midsummer Night’s Dream. As originally conceived, the Overture is better described as a tone poem; it was not written to precede a performance of the play, and dutifully—though brilliantly—it includes within its sonata-form structure clear representations of the fairies, the confidence and urbanity of Duke Theseus’ court, the yearning of the lovers in the wood and the rusticity of the ‘rude mechanicals’ complete with Bottom’s asinine braying. The work is also punctuated by reappearances of the four chords of the opening bars, which descend on the music at key moments, changing the mood like a spell. Mendelssohn’s overture was first performed in Stettin in April 1827, and quickly became one of his most popular pieces. In 1842, however, he was commissioned by the King of Prussia to provide incidental music for a production of the play, to be preceded by the overture; Mendelssohn obliged, and his complete score, consisting of songs, entr’actes and various other little snippets, was heard for the first time in Potsdam, October 1843. The version heard on this recording, focusing on the music of the world of the fairies and the human lovers, was assembled by Sir John Eliot Gardiner and the LSO for performances in London and in Germany as part of celebrations surrounding the 400-year anniversary of Shakespeare’s death. Remarkably, Mendelssohn seems to have had no trouble in re-creating the atmosphere of his teenage masterpiece 16 years on. That much is evident in the Scherzo, which, if a little earthier (perhaps even more sinister) than the fairy music of the Overture, clearly inhabits the same world. Elsewhere, the Intermezzo brings a Schumannesque depiction of the emotional turmoil of the lovers lost in the wood; the Nocturne welcomes Puck’s magical righting of the night’s errors and misunderstandings in one of Mendelssohn’s greatest melodies; two fairies prepare the bower for Titania’s slumber in a Song with Chorus; and the marriage of Theseus and Hippolyta is celebrated in what has become the most ubiquitous Wedding March ever written. Felix Mendelssohn était le petit-fils du philosophe des Lumières Moses Mendelssohn et le fils d’un banquier allemand influent. Né dans une famille de la haute bourgeoisie, il fut dès l’enfance encouragé à étudier le piano, apprit le dessin avec sa mère et fit de solides études classiques et linguistiques. En 1819, il commença l’étude de la composition auprès de Karl Friedrich Zelter. La fortune familiale permit à leur maison de Berlin de devenir le refuge de savants, artistes, écrivains et musiciens. Le philosophe Hegel et le scientifique Humboldt comptaient parmi les visiteurs réguliers, des membres de l’Orchestre de la Cour, ainsi que d’éminents solistes, étaient à disposition pour jouer les dernières œuvres de Felix ou de sa sœur aînée, Fanny. Les douze symphonies pour cordes du jeune Mendelssohn furent ainsi entendues pour la première fois dans le cadre intime du salon paternel. L’entrée de Mendelssohn dans sa maturité artistique fut marquée par son Octuor (1825), puis une ouverture de concert pour Le Songe d’une nuit d’été de Shakespeare (1826). En 1829, Mendelssohn ressuscita la Passion selon saint Matthieu de Bach, cent ans exactement après sa première exécution. Peu après cela, un voyage à Londres et dans les Highlands et les îles d’Ecosse lui inspira l’ouverture Les Hébrides. En 1830, il voyagea en Italie sur le conseil de Goethe et, tandis qu’il se trouvait à Rome, il commença ses symphonies dites «Ecossaise» et «Italienne». En 1835, il fut engagé comme chef d’orchestre au Gewandhaus de Leipzig; il étendit considérablement le répertoire de l’orchestre avec des œuvres anciennes et des partitions de sa main, notamment le Concerto pour violon en mi mineur. Deux ans plus tard, il épousa Cécile Jeanrenaud et, en 1843, il fonda le Conservatoire de Leipzig. Son magnifique oratorio biblique Elijah, commande du Festival de musique de Birmingham où il fut créé en 1846, gagna rapidement l’affection des chorales britanniques et de leur public, aux côtés du Messie de Haendel. Il mourut à Leipzig en 1847. Avec la méticulosité de l’écriture et l’équilibre des formes qui le caractérise, Mendelssohn fut l’un des compositeurs majeurs du XIXe siècle qui regardaient le plus vers le classicisme, mais il était également sujet à des élan de spontanéité romantique. Tel fut certainement le cas lorsqu’il visita l’Ecosse avec un ami, en été 1829: en juillet, ils se trouvaient au palais d’Holyrood et Mendelssohn eut des idées pour une symphonie; et, le 7 août, lors d’une excursion aux Hébrides extérieures, le compositeur écrivit à sa famille: «Afin de vous faire comprendre l’effet extraordinaire que les Hébrides ont exercé sur moi, j’ai écrit ce qui suit, qui m’est venu à l’esprit.» «Ce qui suit», c’était les dix premières mesures de l’ouverture Les Hébrides. Mais il s’agissait de vacances, et Mendelssohn n’était pas en Ecosse pour écrire de la musique. Le jour suivant cette lettre, il fit une sortie en bateau à l’île de Staffa, «avec ses étranges grottes et piliers de basalte», et une année et demie passa encore avant qu’il eût achevé son œuvre hébridienne (à Rome ! ), qu’il intitula Die einsame Insel («L’Ile solitaire»). Des révisions s’ensuivirent—Mendelssohn, dans son combat pour réconcilier classicisme et romantisme, s’inquiétait qu’elle ait le goût «du contrepoint plus que de l’huile de baleine, des goélands et de la morue salée»; et la version de l’ouverture que nous connaissons aujourd’hui, avec son double titre Die Hebriden («Les Hébrides») et Fingalshöhle («La Grotte de Fingal», d’après la curiosité la plus courue de Staffa), ne vit le jour qu’en 1832. L’idée thématique initiale de Mendelssohn forma effectivement le début de l’œuvre, son dessin mélodique tendre et ondoyant et son accompagnement imagé évoquant la mer d’une manière aussi immédiate que le compositeur pouvait l’espérer. Son mélancolique motif descendant de six notes domine cette pièce de dix minutes, malgré un second thème chaleureux et joliment tourné, présenté par les violoncelles et les bassons, et il se soumet à différents changements de climat. Une tempête se lève brièvement dans la section centrale de développement, mais le calme revient vite, grâce notamment au retour paisible du second thème à la clarinette; enfin, la coda subit une dernière bourrasque, elle aussi rapidement apaisée. Mendelssohn est issu d’une famille cultivée et versée dans les arts, la littérature et la philosophie autant que dans la musique. On peut donc imaginer que, lorsqu’il qualifia le Ruy Blas de Victor Hugo de «détestable», après avoir été sollicité pour écrire une ouverture et un air pour une production à Leipzig en mars 1839, ce n’est pas seulement parce qu’il s’était ému du nombre de morts. Située dans l’Espagne du XVIIe siècle, la pièce raconte l’histoire de Ruy Blas, un serviteur cyniquement entraîné par son maître, Don Salluste, à se faire passer pour un grand de la cour et à courtiser la reine, qui dédaigne Salluste mais dont Blas est amoureux. Lorsque Salluste révèle l’extraction modeste de Blas, afin de compromettre la reine et ainsi d’assouvir sa soif de vengeance, Blas humilié se suicide en absorbant du poison, non sans avoir obtenu de la reine qu’elle lui avoue son amour. Même si elle brille aujourd’hui au firmament de l’œuvre d’Hugo, la pièce n’avait rencontré qu’un succès modeste lors de sa création, à Paris, cinq mois plus tôt ; de plus, la production leipzigoise était destinée à alimenter le fonds de pension théâtral local. Mendelssohn accepta tout d’abord de composer l’air, avant de se raviser, semble-t-il piqué au vif qu’on le pense incapable d’écrire l’ouverture dans le délai très court qui lui était imparti. Finalement, il ne mit que trois jours. La pièce qui en résulte est, comme toujours chez Mendelssohn, brillante dans la manière et habile dans la construction, bien que l’énergie insouciante qui y domine paraisse étrangement en contradiction avec le sujet. Seules la musique tourbillonnante et fébrile, en ut mineur, formant le premier thème et, surtout, les nobles accords de vents qui ouvrent l’œuvre et reviennent à plusieurs reprises ponctuer le cours du mouvement (sombres pendants des accords «magiques» de l’ouverture Le Songe d’une nuit d’été, composée treize ans plus tôt), semblent trahir la présence, comme source d’inspiration, du sinistre récit d’Hugo. Sept ans plus tard, Mendelssohn, qui avait déjà inscrit à son catalogue une brillante ouverture pour la pièce de Shakespeare Le Songe d’une nuit d’été, écrivit une nouvelle ouverture inspirée par deux poèmes de Goethe: Meeresstille («Mer calme») et Glückliche Fahrt («Heureux Voyage»). L’ouverture, en tant que forme, ne s’était émancipée que récemment de sa fonction dramatique originelle pour embrasser une nouvelle existence dans les salles de concert, comme courte pièce descriptive; et, à l’évidence, Mendelssohn trouva de quoi nourrir généreusement son inspiration dans les poèmes contrastés de Goethe. Bien qu’il ne fût pas le premier touché par ces textes (Beethoven les avait mis en musique pour chœur en 1815, et Schubert avait fait un lied de Meeresstille la même année), son illustration devait s’imposer comme la plus célèbre. Le sujet de «Mer calme» n’est pas la surface étale qu’apprécient les personnes sujettes au mal de mer, mais plutôt cette absence de vent torpide qui, au temps de la voile, vouaient les vaisseaux à une immobilité désespérante. Goethe fait même allusion à un «calme effrayant et mortel», que Mendelssohn traduit par un sombre adagio, animé seulement d’apathiques courants sous-marins en contrepoint. Finalement, une brise s’élève (flûte solo), le brouillard se dissipe et, après un soudain embrasement orchestral, le vaisseau reprend sa route au son d’une mélodie héroïque, beethovénienne. Mendelssohn peint ensuite une navigation paisible («les zéphyrs murmurent»), entrecoupée par les gestes lestes des matelots, jusqu’à ce que la terre soit en vue, annoncée par des fanfares et des coups de canon aux timbales. Le voyage est terminé, et l’ouverture se conclut sur un soupir de satisfaction et de soulagement. Vous n’avez pas l’occasion tous les soirs d’écouter une symphonie écrite par un génie de quatorze ans et demi. Et le plaisir procuré par cette œuvre particulière se double d’un mystère intrigant; cela concerne le troisième mouvement—le Menuet. Bref, j’ai parcouru ma symphonie; et, Dieu sait pourquoi, le menuet m’est apparu d’un ennui terrible; il était si monotone, si redondant. Du coup, j’ai repris le Scherzo de mon Octuor à cordes et j’y ai ajouté quelques trompettes aériennes. Cela sonne très bien. À vrai dire, Mendelssohn fit un peu plus qu’ajouter seulement quelques «trompettes aériennes»: il réorchestra le morceau avec des vents brillants, tout en conservant la légèreté fantasque de la version originale. C’est si beau que nous avons eu envie de vous faire entendre cette nouvelle version du mouvement d’octuor qui vous est familier. Mais qu’en est-il du Menuet original et de son trio? Sont-ils vraiment aussi mauvais et aussi ennuyeux que Mendelssohn essaie de nous le faire croire? Si tel est le cas, comment se fait-il que, lorsqu’il décida de publier la symphonie, il plaça cette version dans la partition et laissa le Scherzo de côté? Eh bien, comme vous l’avez certainement deviné, vous allez avoir les deux pour le prix d’un. Je pense que les versions sont toutes deux réellement remarquables—comme l’est, en fait, toute la symphonie. Et peut-être nous ferez-vous savoir, à la fin, quelle version a votre préférence! Lorsqu’en 1824 Mendelssohn composa, à quinze ans, sa Symphonie en ut mineur, il la désigna comme «nº 13»; il l’inscrivait ainsi dans la lignée des douze qu’il avait déjà écrites, dites «symphonies pour cordes». Mais la présence d’instruments à vent n’est pas le seul élément qui distingue cette symphonie des précédentes, œuvres d’enfance, et qui justifia la mise en place d’une nouvelle numérotation. Cette partition témoigne d’une assurance nouvelle. Bien qu’étant clairement dans l’héritage de Mozart, Beethoven et Weber, elle fait la preuve, par sa verve et sa construction, d’un talent étonnant pour un compositeur aussi jeune. Le premier mouvement jaillit avec énergie; la tonalité d’ut mineur n’y est signe ni d’un ton tragique (comme chez Mozart) ni d’une agitation ténébreuse (comme chez Beethoven), mais elle renforce le sentiment d’urgence et la force motrice. Si le matériau mélodique n’est pas très marquant en soi, les thèmes principaux sont dessinés d’une plume experte, et la succession de leurs présentations et de leurs reprises est menée avec habileté. Dans l’andante qui suit, les harmonies douillettes du thème principal, dans le mode majeur, apportent un sentiment chaleureux et idyllique; l’une d’elles se charge toutefois d’une certaine inquiétude par les variations qu’elle subit à chaque retour et par les murmures syncopés qui hantent les cordes. En guise de troisième mouvement, l’adolescent Mendelssohn composa à l’origine un énergique Menuetto en ut mineur, au milieu duquel venait contraster un Trio où les bois tanguaient doucement sur les clapotis des cordes. Mais, à l’occasion de son premier séjour à Londres, en 1829—où, du haut de ses vingt ans, il dirigea la symphonie lui-même à l’occasion d’un concert de la Philharmonic Society—, il remplaça ce morceau par une version étoffée et orchestrée du Scherzo de l’Octuor à cordes, page magistrale par son caractère fantasque autant que par son originalité (l’Octuor était né en 1825, un an après la symphonie). L’accueil fut enthousiaste, après quoi Mendelssohn—amorçant avec le public britannique une relation dont l’ardeur ne faiblirait pas—offrit la copie autographe de la partition à la Society, qui continua de la jouer sous cette forme révisée jusqu’à la fin du siècle. Mendelssohn réintroduisit toutefois le troisième mouvement original lorsqu’il fit publier la symphonie en 1831. Sur ce disque, John Eliot Gardiner présente les deux versions côte à côte. Si, après ces mouvements profondément mendelssohniens, le finale con fuoco débute d’une manière proche de celui de la Symphonie en sol mineur de Mozart (K550), il fait preuve à la fois d’originalité (dans la manière dont le tempo ralentit pour laisser entrer des pizzicatos de cordes insistants, d’où émerge une mélodie de clarinette gracile) et de talent (grâce à deux fugues habilement intégrées). On ne peut faire plus simple que la genèse de la Symphonie «Italienne» de Mendelssohn, une oeuvre aussi brillante que chaleureuse. Au cours de l’année 1830, le compositeur de vingt et un ans entreprit un tour d’Italie, visitant Venise et Florence avant de passer l’hiver à Rome, où il commença la composition d’une symphonie célébrant les merveilles visuelles et sonores du sud. «Ce sera la plus jolie partition que j’aie composée jusqu’à présent», écrivit-il à sa famille, ajoutant que l’œuvre avait totalement éliminé de son esprit l’«humeur embrumée» de la Symphonie «Écossaise» (partition qui répondait à ses précédentes vacances et à laquelle il était alors en train de travailler). Il termina l’«Italienne» à son retour en Allemagne, et la première eut lieu à Londres en 1833. À l’instar de Berlioz, qui se trouvait à Rome au même moment, Mendelssohn voyait peu de motifs d’admiration dans la musique italienne contemporaine: «Pourquoi l’Italie insiste-t-elle tant sur le fait qu’elle est le pays de l’Art», écrivit-il à sa famille, «alors que c’est en fait le pays de la Nature, une nature qui enchante chaque cœur? La musique n’y manque pas: elle résonne et vibre de toute part.» C’est le flot d’énergie de la Nature qui semble propulser les premières mesures, avec cette pulsation rapide d’accords de vents et cette ligne de violon s’élevant avec une vigueur et une grâce toutes italiennes. Cet élan perdure à travers tout le premier mouvement; le second thème (aux clarinettes et bassons) est plus suave, mais il repose sur la même formule rythmique. La section centrale de développement introduit une nouvelle mélodie enlevée aux violons, sur laquelle est bâtie la progression vers le sommet d’intensité; cette mélodie reviendra plus tard, après la réexposition des deux précédents thèmes. La marche solennelle constituant le second mouvement aurait été inspirée par la vue d’une procession religieuse (Berlioz inclurait pareillement une «Marche de pèlerins» dans son Harold en Italie, composé quatre ans plus tard). L’évocation de Mendelssohn consiste en une mélodie austère aux couleurs envoûtantes sur un accompagnement moelleux de cordes, mais elle est interrompue par deux épisodes d’une musique plus chaleureuse, plus pastorale, comme si l’observateur était momentanément distrait par la beauté du paysage. À chaque fois, les pèlerins regagnent toutefois son attention, et le mouvement se conclut tandis qu’ils disparaissent au loin. Le troisième mouvement est un menuet de facture classique, même s’il n’est pas désigné comme tel, même si plane sur lui un sentiment de nostalgie mélancolique teinté de romantisme et si les tendres appels de cors de sa calme section centrale rappellent l’univers sylvestre magique de la musique de scène que Mendelssohn composa pour Le Songe d’une nuit d’été. La musique italienne finit par laisser son empreinte sur le finale, bien que ce ne soit pas l’esprit de Rossini ou de Bellini qui y préside mais plutôt celui d’une danse populaire, la saltarelle. Durant l’été 1831, Mendelssohn s’était installé à Naples, et c’est là qu’il découvrit cette vigoureuse danse sautée. La réinterprétation symphonique qu’il en offre est germanique, à n’en point douter—en témoigne la longue incursion, à mi-parcours, d’un contrepoint désinvolte; mais, fougueuse et menée d’une main de fer, elle assure à cette célébration de la vie et de la lumière italiennes la conclusion grisante que l’on attendait. Le fait que le «Lobgesang» («Chant de louange») de Mendelssohn soit également connu comme sa Deuxième Symphonie montre combien c’est une œuvre étrange. Le compositeur lui-même ne savait pas trop comment la catégoriser avant de prendre conseil auprès d’un ami et de la baptiser «symphonie-cantate», façon de reconnaître que, malgré sa trajectoire globale de symphonie en quatre mouvements avec un finale vocal, cette fin chorale—elle-même divisée en neuf sections constituées d’airs, duos, récitatifs et chœurs—est si longue qu’elle domine par ses dimensions les trois premiers mouvements réunis. Une telle forme hybride ne lui a pas toujours valu les faveurs de la critique, mais c’était une œuvre très appréciée au XIXe siècle, et, comme toujours avec Mendelssohn, pleine d’une musique d’une qualité et d’une originalité exceptionnelles. La symphonie chorale n’était pas un concept ntièrement nouveau. La Neuvième de Beethoven, écrite seize ans plus tôt, était bien sûr le grand précurseur de toutes les suivantes; mais en 1839 Berlioz avait produit une version encore plus intégrée et plus radicale de la forme avec Roméo et Juliette. Le «Lobgesang», toutefois, doit son étrangeté avant tout au fait qu’il fut composé pour une occasion spécifique: les célébrations marquant le quatre-centième anniversaire de l’invention de l’imprimerie par Johannes Gutenberg. Leipzig, où Mendelssohn avait vécu pendant les cinq années précédentes, était depuis longtemps un centre important pour le livre et l’imprimerie en Allemagne, et avait choisi de marquer le quadricentenaire avec un festival de trois jours centré autour de l’inauguration d’une nouvelle statue de Gutenberg sur la grand-place de la ville, le 24 juin. La veille avait été donné un nouvel opéra, Hans Sachs d’Albert Lortzing, et le lendemain il y eut pour conclure un grand concert dans l’église de Bach, la Thomaskirche. En tant que principal compositeur et musicien de la ville, Mendelssohn fut invité à écrire une cantate pour la cérémonie d’inauguration (Festgesang, dont fut tirée la mélodie du noël anglais «Hark the herald angels sing»), et à diriger le concert final, qui comprenait la Jubel-Ouverture de Weber, le Te Deum de «Dettingen» de Haendel et la création de cette œuvre. Songeant sans doute à l’héritage de Bach, ainsi qu’à l’importance de la parole imprimée pour la diffusion du protestantisme, Mendelssohn avait utilisé des chorals luthériens dans le Festgesang. Pour le «Lobgesang», il décida d’écrire une œuvre symphonique de grande envergure utilisant un mélange de chorals et de textes des Saintes Écritures. Elle fut publiée comme sa Deuxième Symphonie en 1841, bien que les Quatrième et Cinquième, encore inédites alors, soient antérieures. L’œuvre débute par un thème-devise majestueux entonné par les trombones, auquel répondent des phrases de tout l’orchestre. Ce thème, Mendelssohn l’avait déjà employé trois ans plus tôt en mettant en musique le psaume 42, et il occupe une place éminente dans l’histoire du canon contrapuntique. Bach et Mozart (dans le finale de sa Symphonie «Jupiter») en avaient utilisé des versions. L’échange conduit au corps du mouvement, un Allegro animé de caractère festif, dans lequel le thème-devise fait des apparitions répétées. La fin amène un apaisement de cette agitation, avant qu’une brève cadence de clarinette solo ne conduise au deuxième mouvement—page constamment mélodieuse, chantante, en forme de scherzo. L’atmosphère est ici moins enjouée que mélancolique dans les sections extrêmes, et franchement sérieuse dans la partie centrale, avec sa mélodie de choral entonnée sévèrement. Le troisième mouvement, marqué «Adagio religioso», justifie cette indication avec une musique d’une noble beauté. La partie «cantate» suit avec un retour du thème-devise qui anime un imposant crescendo, au sommet duquel le chœur entre et chante le texte—«Alles was Odem hat, lobe den Herrn!» («Que tout ce qui respire loue le Seigneur!»)—, avant d’éclater en une fugue exubérante. Les quatre mouvements suivants—un récitatif et air pressant pour ténor, un chœur d’imploration solennelle et un duo soprano-ténor plein d’espoir—assombrissent le climat, soulignant le soutien de Dieu dans les moments de difficulté, et atteignant le niveau le plus bas dans un dramatique air de ténor empli d’une angoisse nocturne toute romantique («veilleur, la nuit passerat-elle bientôt?»). Le réconfort vient à la fin de cette section lorsque la soprano annonce: «Die Nacht ist vergangen!» («La nuit est passée!»), et que le chœur reprend le vers et le tourne vers la lumière dans une nouvelle fugue revigorante. À partir de là, le bien-être confiant du début est peu à peu rétabli, avec une nouvelle version chorale du cantique luthérien «Nun danket alle Gott» (que Mendelssohn avait également utilisé dans le Festgesang), puis un autre duo radieux d’action de grâces pour la délivrance, et enfin une grande déclamation chorale et une fugue d’une jubilation haydnienne. Bien que Mendelssohn n’ait jamais cessé d’être préoccupé par la clarté et l’équilibre de la forme, il ne craignait pas de repousser les limites et, dans certaines mesures, d’être innovateur; ses œuvres instrumentales émanent, à n’en point douter, d’un homme qui cherche sans relâche de nouvelles solutions aux problèmes inhérents aux formes existantes. Mais, comme nous l’avons vu avec son ouverture Les Hébrides, il n’était pas à l’abri de stimuli extra-musicaux; élevé au sein d’une famille cultivée, il a tiré très jeune son inspiration musicale de Shakespeare et Goethe, et des paysages, des légendes et de l’histoire. La Symphonie «Ecossaise» est peut-être une de ses œuvres qui synthétise avec le plus de réussite les centres d’intérêt compositionnels antagonistes que constituent la logique formelle et le recours à des images visuelles évocatrices. Dans le crépuscule qui s’intensifiait, nous nous sommes rendus aujourd’hui au palais où la reine Marie vécut et aima … La chapelle voisine a désormais perdu son toit, elle est recouverte par l’herbe et le lierre, et devant cet autel Marie a été couronnée reine d’Ecosse. Tout est brisé, en ruine, et la lumière du jour pénètre partout. Je crois qu’aujourd’hui j’ai trouvé le début de ma Symphonie «Ecossaise». Peu de symphonies voient le moment où naquit leur inspiration attesté avec une telle précision; pourtant, après en avoir esquissé les premières mesures, Mendelssohn les mis de côté, et c’est à l’ouverture Les Hébrides que revint de devenir sa réponse la plus immédiate à son expérience écossaise. À l’époque, il était sous l’effet d’une autre influence pittoresque, fruit d’un voyage en Italie à cause duquel, confia-t-il, il n’arrivait plus à se «replonger dans l’ambiance des brouillards écossais»; une autre symphonie, l’«Italienne» (nº 4), l’occupait à présent, et l’«Ecossaise» ne fut pas achevée avant 1842. La symphonie débute par une longue introduction lente dans laquelle le thème d’Holyrood fait surgir des couleurs lugubres et romantiques, et c’est largement sur une métamorphose nerveuse et rythmée de ce thème que repose le corps principal du mouvement, qui fait suite—en fait, plusieurs des thèmes apparaissant dans les mouvements ultérieurs se rattachent à ce thème initial. Tout au long du premier mouvement, des épisodes tempétueux (souvenirs, sans doute, d’une mer agitée et d’un mauvais temps) se mêlent à des passages plus calmes, mais, malgré les occasions présentées par une robuste section centrale de développement, ce n’est que dans la coda que la tempête s’évanouit véritablement. Le mouvement se termine toutefois sur un retour évocateur de la musique de l’introduction. Mendelssohn indiqua que les quatre mouvements de l’«Ecossaise» devait être joués sans interruption et, de fait, le second mouvement, une sorte de scherzo, se met en place sans même que l’on s’en aperçoive. Il s’agit de la musique la plus ouvertement «écossaise» dans toute la symphonie, mais sa présence est brève, et nous nous retrouvons bientôt dans l’Adagio, un mouvement à la mélancolie magnifique dans lequel une mélodie nostalgique est plusieurs fois assaillie par des passages menaçants rappelant Schubert, mais finit par l’emporter, sans grands dommages. Mendelssohn donna au finale une indication d’exécution supplémentaire, celle d’Allegro guerriero—rapide et guerrier; et, s’il ne s’agit pas à proprement parler de musique de bataille, on peut supposer qu’elle reflète le souvenir d’une autre vue qui l’impressionna, celle de Highlanders dans leur costume resplendissant. Le mouvement regorge de thèmes habilement opposés et combinés; toutefois, le compositeur choisit de conclure non pas dans un grand tourbillon mais en ralentissant et en faisant entendre, dans les dernières mesures, une métamorphose chaleureuse et consolatrice du thème «de Holyrood». Ainsi, quels que soient les hommages conscients de l’oeuvre à l’Ecosse, la cohérence formelle est-elle préservée sans efforts. Malgré son numéro d’ordre et son numéro d’opus, la Symphonie «Réformation» est la deuxième que Mendelssohn écrivit pour grand orchestre, avant les Symphonies «Lobgesang», «Ecossaise» et «Italienne». Il en commença la composition en décembre 1829, juste après être rentré à Berlin de son premier séjour dans les îles britanniques, et il la destinait à marquer, l’année suivante, le tricentenaire de la Confession d’Augsbourg, l’assemblée qui avait défini les croyances fondamentales de la Réforme luthérienne. Différents éléments concoururent toutefois à faire échouer ce projet, et la symphonie fut finalement présentée au public à Berlin en 1832. Il peut sembler bizarre qu’un compositeur de naissance juive ait choisi pour sujet la Réforme protestante, mais la tolérance religieuse était grande dans la famille Mendelssohn, au moins depuis que le grand-père du compositeur, le philosophe Moses Mendelssohn, avait aidé les juifs prussiens à obtenir l’équité sociale. De plus, Felix et ses frères et sœurs avaient été baptisés dans la foi chrétienne en 1816. À l’origine de cette symphonie, on peut également déceler une impulsion d’ordre musical: depuis l’adolescence, Mendelssohn étudiait Bach avec délectation, en particulier certaines œuvres vocales qui, à l’époque, passaient pour impossibles à donner en concert; et, en mars 1829, il avait dirigé la première exécution de la Passion selon saint Matthieu postérieure à Bach. Par ailleurs, il avait lui-même composé plusieurs pièces reposant sur des mélodies de cantiques luthériens (ou chorals). Dans ce contexte, une symphonie pourvue d’un finale reposant sur l’un des chorals les plus connus—Ein’ feste Burg ist unser Gott («Notre Dieu est une forteresse solide»)—peut sembler une évolution assez naturelle. Le premier mouvement s’ouvre par une introduction lente dans laquelle un contrepoint aux lentes ondulations et des fanfares de plus en plus pressantes conduisent à deux énoncés éthérés, aux cordes aiguës, d’un motif ascendant de six notes connu sous le nom d’«Amen de Dresde». Selon certains commentateurs, cette référence à la liturgie catholique avait pour dessein de représenter l’ancienne Eglise acculée par la controverse et, de fait, lorsque la musique se jette dans l’Allegro proprement dit (en passant au mode mineur), c’est dans un climat de lutte et d’agitation. À la fin de la section centrale de développement, le motif de l’«Amen» revient; il fait à présent pénétrer dans une réexposition au ton feutré, mais qui progresse à nouveau vers un sommet d’intensité tumultueux. Le Scherzo est tout de grâce et de légèreté mais, bien qu’il semble s’écarter du climat général de la symphonie—il est plus bucolique que révérencieux—, il conserve des liens thématiques avec les motifs descendants des bois au tout début. Par sa brièveté, le solennel troisième mouvement donne l’impression d’être conçu en partie comme une introduction au finale—cette impression est renforcée par une phrase de violon dans le style d’un récitatif. Le finale débute par un énoncé aux chaudes harmonies d’Ein’ feste Burg ist unser Gott, qui prélude à une forme sonate. Le choral s’invite occasionnellement au milieu des thèmes propres de cette sonate, et sa dernière apparition offre à la partition une conclusion en majesté. L’extraordinaire activité compositionnelle du jeune Mendelssohn—qui, à seize ans, comptait déjà à son actif douze symphonies pour cordes, six opéras, l’étonnant Octuor à cordes et bien d’autres choses encore—est indissociable de l’éducation culturelle qu’il reçut et qui fit de lui un jeune homme versé dans la littérature et les arts. En plus de ses activités musicales, il écrivait des poèmes, peignait et dessinait, et la demeure de ses parents à Berlin était l’un des salons intellectuels les plus actifs d’Allemagne; on y donnait fréquemment des concerts, des représentations théâtrales et des lectures littéraires, et parmi ses habitués figuraient scientifiques, philosophes, acteurs, écrivains et musiciens. Ces expériences nourrirent l’inspiration de Felix et, au cours de l’été 1826, âgé de seulement dix-sept ans, il s’attela à une ouverture de concert inspirée par la comédie féerique de Shakespeare Le Songe d’une nuit d’été. Telle qu’elle fut conçue à l’origine, cette Ouverture est plutôt de l’ordre du poème symphonique. Elle n’avait pas pour dessein de précéder une représentation de la pièce et fait défiler consciencieusement—et certes avec brio—, dans le cadre d’une forme sonate, des musiques que l’on associe clairement aux fées, à l’assurance et à l’urbanité régnant à la cour du duc Thésée, au désir des amants dans le bois et à la rusticité des «frustes artisans», couronnée par les braiements asiniens de Bottom. La partition est également ponctuée par le retour des quatre accords des premières mesures, qui s’abattent sur la musique aux moments clefs, faisant basculer l’atmosphère comme si on avait jeté un sort. L’Ouverture du Songe d’une nuit d’été fut jouée pour la première fois à Stettin en avril 1827 et s’imposa rapidement comme une des pièces les plus populaires de Mendelssohn. En 1842, à l’occasion d’une production de la pièce, le roi de Prusse passa commande au compositeur d’une musique de scène à faire précéder par l’ouverture; Mendelssohn accepta, et la partition entière, consistant en chansons, entractes et diverses petites interventions, résonna pour la première fois à Potsdam en octobre 1843. La version présentée dans cet enregistrement, qui se concentre sur la musique associée au monde des fées et des amoureux humains, a été assemblée par Sir John Eliot Gardiner et le LSO à l’occasion de concerts à Londres et en Allemagne, dans le cadre des manifestations entourant le quatre centième anniversaire de la mort de Shakespeare. Fait remarquable, Mendelssohn semble n’avoir eu aucune peine à recréer, seize ans plus tard, l’atmosphère de son chef-d’oeuvre d’adolescence. Cela saute aux oreilles particulièrement dans le Scherzo, qui, bien qu’étant un peu plus terrien (voire plus sinistre) que la musique féerique de l’Ouverture, procède à l’évidence du même univers. Pour sa part, l’Intermezzo offre une illustration schumanienne du désarroi émotionnel étreignant les amants perdus dans le bois; le Nocturne accompagne par une des plus belles mélodies de Mendelssohn Puck qui, par la magie, répare toutes les erreurs et tous les malentendus de la nuit; au son d’une Chanson avec chœur, deux fées préparent le berceau de verdure qui accueillera le sommeil de Titania; et le mariage de Thésée et Hippolyte est célébré au son d’une Marche nuptiale qui a envahi le monde entier. Felix Mendelssohn Bartholdy war der Enkel von Moses Mendelssohn, dem großen Philosophen der Aufklärung, und der Sohn eines einflussreichen deutschen Bankiers. Als Sohn einer privilegierten Familie der höheren Mittelschicht erhielt er schon früh Klavierunterricht, seine Mutter lehrte ihn das Zeichnen, er galt als fähiger Linguist und klassischer Gelehrte. Ab 1819 erhielt er Unterricht in Komposition von Karl Friedrich Zelter. Durch den Wohlstand der Familie wurde ihr Haus in Berlin zu einem Treffpunkt für Gelehrte, Maler, Schriftsteller und Musiker. Der Philosoph Hegel und der Naturwissenschaftler Humboldt waren regelmäßig zu Gast, Mitglieder der Hofkapelle und namhafte Solisten spielten die neuesten Werke von Felix und seiner älteren Schwester Fanny. Auch Mendelssohns zwölf Streichersinfonien, die er als Jugendlicher komponierte, wurden erstmals im intimen Rahmen des häuslichen Salons zu Gehör gebracht. Als Beweis für Mendelssohns frühe Reife als Komponist können sein Oktett (1825) und die Konzertouvertüre zu Shakespeares Sommernachtstraum (1826) gelten. 1829, genau hundert Jahre nach der Premiere von Bachs Matthäuspassion, brachte er das Werk erstmals wieder zur Aufführung. Eine wenig später erfolgende Reise nach London, auf die schottischen Inseln und in die Highlands inspirierte ihn zu der Ouvertüre Die Hebriden. Im Jahr darauf reiste er auf Anregung Goethes nach Italien und begann in Rom die Arbeit an der so genannten „Schottischen“ und der „Italienischen“ Sinfonie, 1835 wurde er zum Kapellmeister am Leipziger Gewandhaus berufen, wo er das Repertoire erheblich erweiterte und nicht nur frühe Musik, sondern auch eigenen Werke aufs Programm setzte, unter anderem das Violinkonzert e-Moll. Zwei Jahre später heiratete er Cecile Jeanrenaud, 1843 gründete er in Leipzig das Konservatorium. Sein großartiges biblisches Oratorium Elias, das vom Birmingham Musical Festival in Auftrag gegeben war und 1846 dort seine Premiere erlebte, stand in der Gunst englischer Gesangsvereine und ihres Publikums bald neben Händels Messias. Mendelssohn starb 1847 in Leipzig. Aufgrund seiner ausgefeilten Vorgehensweise und seiner Vorliebe für formale Ausgewogenheit gilt Mendelssohn als einer der „klassischsten“ der großen Komponisten des 19. Jahrhunderts, doch waren ihm Momente romantischer Spontaneität nicht fremd. Und einen solchen Moment erlebte er zweifellos, als er im Sommer 1829 mit einem Freund durch Schottland reiste. Im Juli besichtigten sie den Holyrood Palace, und in Mendelssohn reiften Ideen für eine Sinfonie heran. Nach einem Besuch der Western Isles schrieb er seiner Familie: „Um Euch zu verdeutlichen, wie seltsam mir auf den Hebriden zumute geworden ist, fiel mir eben folgendes bei.“ Mit „folgendes“ meinte er die ersten zehn Takte der Hebriden-Ouvertüre. Aber die Reise sollte ein Urlaub sein, Mendelssohn war nicht zum Komponieren nach Schottland gekommen. Am Tag, nachdem er diesen Brief geschrieben hatte, fuhr er mit dem Boot zur Insel Staffa, wo ihm insbesondere die Basaltsäulen und Höhlen auffielen; erst eineinhalb Jahre später beendete er seine Hebriden-Komposition (und zwar in Rom!) und gab ihr den Titel Die einsame Insel. Es folgten Überarbeitungen; Mendelssohn kämpfte darum, das Klassische und das Romantische zu verbinden, und war unzufrieden, weil die erste Fassung „mehr nach Kontrapunkt als nach Tran und Möwen und Laberdan [schmeckt].“ In der Fassung, in der wir die Ouvertüre heute kennen, mit den beiden Titeln Die Hebriden und Fingalshöhle, nach der bekanntesten Sehenswürdigkeit auf Staffa, entstand sie erst 1832. Mendelssohns ursprüngliches Thema blieb allerdings als Einleitung erhalten; die sanft sich wiegende Melodielinie und die atmosphärische Begleitung beschwören das Meer zweifelsohne so unmittelbar herauf, wie es einer Musik nur möglich sein kann. Das melancholische, aus sechs absteigenden Noten bestehende Motiv bestimmt das gesamte zehnminütige Werk, auch wenn es ein warmes, formschön aufsteigendes zweites Thema gibt, das zunächst in den Celli und Fagotten zu hören ist und einer Reihe von Stimmungsveränderungen unterzogen wird. Im mittleren Durchführungsteil zieht kurz ein Gewitter auf, doch bald breitet sich wieder Ruhe aus, insbesondere, als das zweite Thema unaufgeregt auf der Klarinette aufklingt, ehe die Koda eine letzte Bö aufleben lässt, die sich ebenfalls rasch legt. Mendelssohn wurde im März 1839 gebeten, eine Ouvertüre und ein Lied für eine Leipziger Inszenierung von Victor Hugos Theaterstück „Ruy Blas“ zu schreiben. Mendelssohn stammte aus einer kultivierten Familie, die sich mit Kunst, Literatur, Philosophie und Musik auskannte. So können wir davon ausgehen, dass er das Theaterstück nicht nur deshalb als „abscheulich“ bezeichnete, weil er auf die hohe Anzahl von Leichen zimperlich reagierte. Das Drama spielt im Spanien des 17. Jahrhunderts und erzählt die Geschichte von Ruy Blas, einem Diener, der von seinem Herren, Don Salluste, zynisch verleitet wird, sich als Grande am Hof auszugeben und die Königin zu verführen. Diese hatte Salluste einen Korb gegeben, und Blas liebte sie. Wenn Salluste die Wahrheit über Blas’ bescheidene Herkunft offenbart, um die Königin zu kompromittieren und so Rache zu üben, tötet der gekränkte Blas ihn und nimmt selbst Gift, jedoch erst, nachdem die Königin ihre Liebe bekundet hat. Trotzt der späteren hohen Wertschätzung in Hugos Oeuvre erntete das Stück bei seiner Uraufführung in Paris fünf Monate zuvor nur bescheidenen Erfolg. Die Leipziger Inszenierung wurde zur Unterstützung des lokalen Theaterrentenfonds gespielt. Ursprünglich hatte Mendelssohn nur zugesagt, das Lied zu komponieren, gab am Ende aber nach, angeblich weil er sich über den Vorwurf pikierte, er könne die Ouvertüre in dem zugegebenermaßen kurzen Zeitraum nicht komponieren. Am Ende brauchte er nur drei Tage dafür. Das Ergebnis ist, wie immer bei Mendelssohn, stilistisch brillant und handwerklich gekonnt, auch wenn die vorherrschende sorglose Energie gleichsam im Gegensatz zum Thema steht. Nur die wirbelnde, fieberhafte C-Moll-Musik des ersten Themas und vor allem die erhabenen Holzbläserakkorde, die das Werk einleiten und mehrmals zur Artikulation des Satzverlaufs wiederkehren (eine dunkle Entsprechung zu den „Zauberakkorden“ aus der Ouvertüre zum Sommernachtstraum 13 Jahre zuvor), scheinen auf die angebliche Anregung aus Hugos grausiger Geschichte zu verweisen. Sieben Jahre später schuf Mendelssohn, der schon auf die Komposition einer brillanten Ouvertüre zu Shakespeares Theaterstück A Midsummer Night’s Dream [„Ein Sommernachtstraum“] verweisen konnte, eine neue Ouvertüre, diesmal auf zwei Gedichte von Goethe: Meeresstille und Glückliche Fahrt. Die Ouvertüre als Gattung hatte sich erst kurz zuvor von seiner ursprünglichen Rolle im Theater befreit und tauchte nun als kurzes illustratives Stück im Konzertsaal auf. Mendelssohn fand offenbar reichlich Inspiration in Goethes kontrastierenden Versen. Auch wenn er nicht der erste war, der so angeregt wurde (Beethoven hatte 1815 ein Chorwerk auf die Gedichte geschaffen, und Schubert vertonte im gleichen Jahr Meeresstille zu einem Lied), ist seine Fassung die bekannteste. Das Thema Meeresstille dreht sich nicht um die glatte Fläche angenehm für Menschen, die zu Seekrankheit neigen, sondern eher um die schwülen, windstillen Bedingungen, die ein Schiff im Zeitalter der Segelfahrt zur Untätigkeit verdammten. Goethe spricht sogar von einer „Todesstille fürchterlich“, die Mendelssohn mit einem düsteren Adagio umsetzt, das nur schwerfällig durch untergründige Kontrapunktlinien in Bewegung gerät. Schließlich haucht ein Flötensolo etwas Leben ins Geschehen, der Nebelschleier hebt sich, und nach einem Ausbruch von Aufregung im Orchester ist das Schiff auf dem Weg zu einer heroischen, an Beethoven mahnenden Melodie. Daraufhin segelt die Musik mit dem Wind („es säuseln die Winde“) mit Einschüben von behändig arbeitenden Matrosen, bis Land in Begleitung begrüßender Fanfaren und Paukendonner in Sicht kommt. Die Reise ist vorüber, und die Ouvertüre endet mit einem zufriedenen Seufzer der Erleichterung. Man hat nicht jeden Abend die Möglichkeit, die Sinfonie eines vierzehnundeinhalbjährigen Genies zu hören. Dazu kommt in diesem besonderen Stück eine interessante Frage: Sie dreht sich um den dritten Satz—das Menuetto. Kurz, ich habe … meine Symphonie durchgegangen; und Gott weiß, wie es kam, die Menuette langweilte mich schrecklich; mir schien sie monoton, und kam mir wie ein Pleonasmus vor. Und da habe ich... das Scherzo des Oktetts mitten hinein spielen lassen, nur einige luftige d Trompeten dazu gesetzt. Es war sehr dumm, aber es klang sehr nett. In Wirklichkeit setzte er eindeutig mehr als nur ein paar luftige Trompeten dazu: Er bearbeitete das Scherzo für Orchester mit brillanten Stimmen für die Holzbläser und erhielt dabei trotzdem die quecksilbrige Leichtigkeit der Originalfassung. Es gelang ihm so gut, dass wir dachten, Sie sollten diese neue Fassung des bekannten Oktettsatzes hören. Was passiert dann mit dem ursprünglichen Menuetto und Trio? Sind sie tatsächlich so schlecht und so langweilig, wie uns das Mendelssohn gern glauben machen möchte? Wenn dem so wäre, stellt sich die Frage, warum er sich dann bei der Drucklegung des Werkes wieder für den ursprünglichen Satz und nicht für das Scherzo entschied. Wie Sie vielleicht schon vermutet haben, bekommen sie zwei für den Preis von einem. Ich halte wirklich beide Sätze für beachtenswert—wie ja auch die gesamte Sinfonie—und vielleicht lassen Sie uns am Ende wissen, welche Fassung Ihnen am besten gefällt. Der 15-jährige Mendelssohn gab seiner 1824 geschaffenen Sinfonie in c-Moll die Nummer 13, ein Zeichen, dass er diese Sinfonie anfänglich als Nachfolgerin seiner zwölf fein gearbeiteten, so genannten „Streichersinfonien“ hielt, die er in den drei Jahren zuvor komponiert hatte. Aber nicht nur der Einsatz von Holzblasinstrumenten hob die Sinfonie von diesen Jugendwerken ab und führte zum Neuansatz der Nummerierung. Die Sinfonie in c-Moll befindet sich auf einer höheren Ebene der Selbstsicherheit. Auch wenn sie bisweilen nach Mozart, Beethoven und Weber klingt, bezeugen ihre Kraft und Konstruktion eine erstaunliche Fähigkeit für einen so jungen Komponisten. Der erste Satz sprudelt voller Energie. C-Moll signalisiert hier nicht Tragödie (wie bei Mozart) oder dunkle Turbulenz (à la Beethoven), sondern forschen Drang und Elan. Das melodische Material an sich mag sich vielleicht nicht besonders auszeichnen, aber die Hauptthemen sind geschickt definiert und die Folge ihres Einsatzes und ihrer Wiederkehr gut kontrolliert. Darauf folgt ein Andante, in dem die angenehmen Durtonarten des Hauptthemas ein Gefühl warmer Idylle erzeugen. Allerdings schleicht sich durch das Variieren des Themas bei jeder Wiederaufnahme und das immer wieder auftauchende synkopierte Murmeln der Streicher zunehmend eine gewisse Ruhelosigkeit ein. Für den dritten Satz schrieb der jugendliche Mendelssohn ursprünglich ein energisches Menuetto in c-Moll mit einem kontrastierenden Trio in der Mitte, in dem Holzbläser leicht über wellenartigen Streichern schweben. Als Mendelssohn im Mai 1829 London besuchte (nun immerhin 20 Jahre alt), dirigierte er die Sinfonie in einem Konzert der Philharmonic Society. Für diese Aufführung tauschte er das Menuetto mit seiner eigenen Orchesterbearbeitung des hervorragend quecksilbrigen und einzigartigen Scherzos aus dem Streicheroktett aus, das er 1825, also ein Jahr nach der Sinfonie, geschaffen hatte. Die Sinfonie fand enthusiastischen Beifall und war der Startschuss für die anhaltend herzliche Beziehung zwischen Mendelssohn und den britischen Hörern. Nach der Aufführung überreichte Mendelssohn seine handschriftliche Sinfoniepartitur an die Philharmonic Society, die das Werk den Rest des Jahrhunderts in dieser geänderten Form spielen ließ. Als die Sinfonie jedoch 1831 im Druck erschien, hatte Mendelssohn wieder den ursprünglichen dritten Satz eingefügt. In der hier vorliegenden Einspielung stellt John Eliot Gardiner beide Fassungen nebeneinander vor. Auch wenn der Beginn des Schlusssatzes con fuoco nach diesen durch und durch Mendelssohn’schen Sätzen wie der Schlusssatz aus Mozarts G-Moll-Sinfonie (K550) klingen mag, trifft man hier im weiteren Verlauf auch auf Originalität (z. B. in der Art und Weise, wie sich die Musik verlangsamt, um pirschende Streicherpizzikati zuzulassen, über denen sich eine schlanke Klarinettenmelodie herausschält) und Handwerk (z. B. in zwei gekonnt assimilierten Fugen). Die Genese von Mendelssohns warm strahlender Italienischer Sinfonie könnte einfacher nicht sein. Im Herbst 1830 begab sich der 21-jährige Komponist auf eine Reise nach Italien, wo er Venedig und Florenz besuchte und dann den Winter in Rom verbrachte. Hier in Rom begann er mit der Arbeit an einer Sinfonie, die die Sehenswürdigkeiten und Klänge des Südens zum Ausdruck bringen sollte. Die Sinfonie war „das lustigste Stück, was ich je gemacht habe“, schrieb Mendelssohn an seine Familie, und fügte hinzu, dass dieses Sinfonieprojekt die „Nebelstimmung“ der Schottischen Sinfonie (das Resultat einer früheren Reise; ein anderes Werk, an dem er gerade arbeitete), völlig aus seinem Kopf vertrieb. Die Italienische Sinfonie wurde nach Mendelssohns Rückkehr in Deutschland beendet und 1833 in London uraufgeführt. Wie Berlioz, der sich zur gleichen Zeit in Rom aufhielt, sah Mendelssohn wenig Bewundernswertes in der damaligen zeitgenössischen italienischen Musik. „Warum soll auch Italien heut zu Tage mit Gewalt ein Land der Kunst sein, während es das Land der Natur ist, und dadurch Alles beglückt!“ „Kein Mangel an Musik hier; es hallt und schallt an allen Seiten.“ (Übersetzung des letzten Zitats aus dem Englischen, d. Ü.) Sicherlich bekommt man den Eindruck, als sei gleich der Beginn der Sinfonie von der unbändigen Energie der Natur erfüllt. Eindrucksvoll kurbeln dabei die pulsierenden Holzbläserakkorde und eine aufsteigende Violinlinie von italienischer Sportlichkeit und Anmut das Geschehen an. Dieser Elan wird im gesamten ersten Satz beibehalten. Ein zweites Thema (von den Klarinetten und Fagotten vorgestellt) ist weicher, aber vom gleichen rhythmischen Schlag. Der zentrale Durchführungsabschnitt präsentiert eine flotte neue Melodie in den Violinen, mit deren Hilfe ein Höhepunkt angesteuert wird. Diese Melodie kehrt nach der Reprise der Anfangsthemen wieder zurück. Man sagt, der feierliche Marsch des zweiten Satzes sei von dem Anblick einer religiösen Prozession angeregt worden (Berlioz fügte einen ähnlichen Marsch („Marsch der Pilger“) in seinen vier Jahre später komponierten Harold in Italien ein). Mendelssohns Darstellung besteht aus einer kargen und unheimlich anmutenden Melodie über einer weich polsternden Streicherbegleitung. Jedoch gibt es auch zwei Episoden mit wärmerer, ländlicherer Musik, als ob der Zuschauer für einen Moment durch die Schönheit der Landschaften abgelenkt wird. Beide Male ziehen die Pilger aber wieder die Aufmerksamkeit auf sich zurück, und der Satz endet mit dem Verschwinden des Umzugs in der Ferne. Der dritte Satz ist ein klassisches Menuett, auch wenn er nicht diesen Namen trägt und eher ein romantisch gefärbtes Gefühl wehmütiger Nostalgie verbreitet. Der Satz enthält einen Mittelteil, dessen sanfte Hornrufe die Welt des Zauberwalds aus Mendelssohns eigener Musik zum Sommernachtstraum beschwört. Im Schlusssatz hört man endlich auch italienische Musik. Aber hier herrscht nicht das Genie eines Rossinis oder Bellinis, sondern der Volkstanz mit Namen Saltarello. Im Sommer 1831 war Mendelssohn mittlerweile nach Neapel gezogen, wo er diesen energischen Sprungtanz erlebte. Mendelssohns sinfonische Version hat natürlich einen germanischen Charakter—man braucht sich in der Satzmitte nur die lange Abschweifung mit dem sich gelassen gebenden Kontrapunkt anzuschauen. Aber Mendelssohns Saltarello ist schwungvoll und energisch und liefert so einen ausreichend berauschenden Abschluss zu diesem Fest des italienischen Lebens und Lichtes. Die Chorsinfonie war kein völlig neues Konzept. Beethovens 16 Jahre zuvor entstandene Neunte war natürlich das große Vorbild, doch 1839 hatte Berlioz mit Roméo et Juliette ein noch radikaleres, noch stärker integriertes Beispiel für diese Form geschaffen. Das Besondere am „Lobgesang“ ist aber, dass er für einen konkreten Anlass geschrieben wurde, nämlich zu den Feierlichkeiten zum 400-jährigen Jubiläum von Johannes Gutenbergs Erfindung des Buchdrucks mit beweglichen Lettern. Die Stadt Leipzig, in der Mendelssohn bereits seit fünf Jahren lebte, war schon lange ein Zentrum der Bücher und des Buchdrucks, und deswegen hatten die Stadtväter beschlossen, das Ereignis mit einer dreitägigen Feier zu begehen, bei der als Höhepunkt am 24. Juni auf dem Marktplatz eine neue Gutenberg-Statue enthüllt werden sollte. Am Vortag kam eine neue Oper zur Aufführung—Hans Sachs von Albert Lortzing—, am Tag danach gab es ein abschließendes Festkonzert in Bachs Thomaskirche. Als führender Komponist und Musiker der Stadt wurde Mendelssohn gebeten, eine Kantate zur Enthüllung der Statue zu schreiben (der „Festgesang“, dem das sehr beliebte englische Weihnachtslied „Hark the herald angels sing“ seine Melodie verdankt) und das Schlusskonzert zu dirigieren, bei dem Webers Jubel-Ouvertüre, Händels Dettinger Te Deum sowie die Premiere dieses Werks auf dem Programm standen. Zweifellos eingedenk Bachs Vermächtnis und der Bedeutung, die dem gedruckten Wort bei der Verbreitung des evangelischen Glaubens zukam, hatte Mendelssohn im Festgesang mit evangelischen Chorälen gearbeitet. Beim „Lobgesang“ dann entscheid er sich für ein groß angelegtes sinfonisches Werk mit einer Mischung von Kirchenliedern und Bibelzitaten. Es wurde 1841 als Sinfonie Nr. 2 veröffentlicht, auch wenn die zu der Zeit noch nicht erschienenen Sinfonien Nr. 4 und Nr. 5 früher entstanden waren. Daran schließt sich der „Kantaten“-Teil an. Das einleitende Motto vom Anfang kehrt zurück und steigert sich zu einem gewaltigen Crescendo, auf dessen Höhepunkt der Chor einstimmt und die Musik mit Text unterlegt—„Alles was Odem hat, lobe den Herrn!“—, bis sie in fugalem Überschwang aufwallt. Die nächsten vier Sätze—ein dringliches Rezitativ mit Arie für Tenor, ein feierlich beschwörender Chor und ein hoffnungsvolles Duett von Sopran und Tenor—verschatten die Stimmung zunehmend und unterstreichen den Beistand Gottes in schweren Zeiten; der Tiefpunkt wird in einer dramatischen Tenorarie von romantischer nächtlicher Furcht erreicht: „Hüter, ist die Nacht bald hin?“ Trost bringt das Ende dieses Abschnitts mit der Beruhigung des Soprans: „Die Nacht ist vergangen!“, der Chor greift diese Zeile auf und wandelt sie in einer weiteren belebenden Fuge zu Helligkeit. Von diesem Punkt an setzt sich langsam das zuversichtliche Wohlbefinden des Anfangs wieder durch, zunächst mit einer unveränderten Wiedergabe des evangelischen Kirchenlieds „Nun danket alle Gott“ (das Mendelssohn auch im Festgesang verwendet hatte), dann mit einem weiteren Duett, das jubelnd für die Erlösung dankt, und schließlich einer großartigen Deklamation im Chor mit einer Fuge von Haydnscher Pracht. So unabdingbar formale Klarheit und Ausgewogenheit für Mendelssohn beim Komponieren auch waren, scheute er nicht davor zurück, an die Grenzen des Machbaren zu gehen und innerhalb eines gewissen Rahmens auch innovativ zu sein. Immerhin sind seine Instrumentalwerke die Kompositionen eines Menschen, der ständig nach neuen Lösungen für die den bestehenden Formen innewohnenden Probleme suchte. Doch wie wir bereits bei seiner Hebriden-Ouvertüre gesehen haben, war er auch gegen außermusikalische Anregungen nicht immun. Er stammte aus einer sehr kulturinteressierten Familie und ließ sich bereits in jungen Jahren musikalisch nicht nur von Shakespeare und Goethe inspirieren, sondern auch von Landschaften, Legenden und der Geschichte. Die gegensätzlichen kompositorischen Anliegen von formaler Logik und bildlichdeskriptiver Beschwörung leben allerdings in nur wenigen Werken derart gelungen miteinander wie in der „Schottischen“. In der tiefen Dämmerung gingen wir heute nach dem Palaste, wo Königin Maria (Stuart) gelebt und geliebt hat—Der Kapelle daneben fehlt nun das Dach; Gras und Efeu wachsen viel darin, und am zerbrochenen Altar wurde Maria zur Königin von Schottland gekrönt. Es ist da alles zerbrochen, morsch, und der heitere Himmel scheint hinein. Ich glaube, ich habe heut da den Anfang meiner „Schottischen Sinfonie“ gefunden. Von wenigen Sinfonien ist der Moment ihrer Inspiration derart genau bekannt, doch nachdem Mendelssohn das einleitende Thema skizziert hatte, legte er das Werk beiseite, womit der Hebriden-Ouvertüre das Privileg zukam, als seine unmittelbare Reaktion auf die Schottlandreise zu gelten. Dann war er auch schon einem anderen bildhaften Einfluss erlegen, und zwar bei einer Reise nach Italien, die es ihm unmöglich machte, zu seiner nebligen schottischen Stimmung zurückzukehren, wie er selbst meinte; nun beschäftigte ihn eine weitere Sinfonie, die „Italienische“ (Nr. 4), so dass er die „Schottische“ erst 1842 abschloss. Sie beginnt mit einer ausgedehnten langsamen Einleitung, in der das Holyrood-Thema eine düstere, romantische Atmosphäre beschwört. Das Gros des weiteren Satzes beruht auf einer rastlos wiegenden Verwandlung dieses Themas, und auch mehrere Themen in den späteren Sätzen greifen auf dieses einleitende Motiv zurück. Den ersten Satz hindurch wechseln sich stürmischere Passagen (die zweifellos an eine raue See und schlechtes Wetter erinnern sollen) mit ruhigeren Episoden ab, doch trotz der Möglichkeiten, die der robuste mittlere Durchführungsteil bietet, bricht der Sturm erst in der langen Koda los. Allerdings endet der Satz mit einer Rückkehr zur Stimmung und Musik der Einleitung. Nach Mendelssohns Vorgabe werden die vier Sätze der „Schottischen“ ohne Pause gespielt, und so schleicht der Scherzo-artige zweite fast unbemerkt herein. Hier erklingt die unverkennbar „schottischste“ Musik der Sinfonie, doch ist der Satz recht kurz, und bald schon finden wir uns im Adagio wieder, einem wehmütig schönen Satz, in dem eine sehnsüchtige Liedmelodie mehrmals von Passagen Schubertscher Bedrohlichkeit attackiert wird, ehe sie relativ unversehrt die Oberhand gewinnt. Beim Finale schrieb Mendelssohn zusätzlich die Spielweise „Allegro guerriero“ vor—schnell und kriegerisch—, und auch wenn die Musik nicht unbedingt eine Schlacht beschwört, so können wir uns doch vorstellen, dass sie an einen anderen Anblick erinnert, der den Komponisten beeindruckte: Highlander in ihrer herrlichen Tracht. Der Satz ist von großartig kontrastierten und kombinierten Themen geprägt, und doch endet er nicht mit einem grandiosen, wirbelnden Höhepunkt, vielmehr lässt der Komponist die Musik langsamer werden und schließt mit einer letzten, beruhigenden Verwandlung des „Holyrood“-Themas. Und so wird die formale Kohärenz des Werks, aller bewussten schottischen Elemente zum Trotz, mühelos beibehalten. Trotz Opusnummer und Zählung als fünfte ist Mendelssohns „Reformations“-Sinfonie eigentlich seine zweite Sinfonie für großes Orchester und entstand vor seiner „Lobgesang“-, „Schottischen“ und „Italienischen“ Sinfonie. Mendelssohn begann seine Sinfonie Nr. 5 1829 kurz nach seiner Rückkehr nach Berlin von seiner ersten Reise zu den Britischen Inseln. Er beabsichtigte mit dem Werk, den 300. Gedenktag der Confessio Augustana im Jahr darauf zu würdigen. Jene Schrift hatte die grundlegenden Bekenntnisse des lutherischen Protestantismus festgehalten. Eine Reihe von Faktoren vereitelte aber Mendelssohns Plan, und die Sinfonie wurde erst 1832 in Berlin uraufgeführt. Es mag merkwürdig erscheinen, dass ein als Jude geborener Komponist die protestantische Reformation als Thema wählte. Religiöse Toleranz war in der Familie Mendelssohn jedoch ein wichtiges Thema. Schon Felix’ Großvater, der Philosoph Moses Mendelssohn, hatte sich für religiöse Toleranz ausgesprochen und dabei preußischen Juden zu einer besseren gesellschaftlichen Stellung verholfen. Darüber hinaus wurden Felix und seine Geschwister 1816 christlich getauft. Vielleicht gab es aber auch einen musikalischen Impuls für das Werk: Mendelssohn hatte seit seinen mittleren Jugendjahren Gefallen an Bach gefunden und sich mit seiner Musik auseinandergesetzt. Dazu gehörten auch solche Vokalwerke, deren Aufführung zu jener Zeit für unpraktisch gehalten wurde. Im März 1829 dirigierte Mendelssohn zum Beispiel die erste Aufführung der Matthäuspassion seit Bachs Lebzeiten. Zudem hatte Mendelssohn selbst eine Reihe von Werken komponiert, die auf lutherischen Chorälen beruhten. In diesem Zusammenhang mag die Komposition einer Sinfonie mit einem Schlusssatz, der auf dem bekanntesten Choral von allen—Ein feste Burg ist unser Gott—beruht, auf der Hand gelegen haben. Der erste Satz beginnt mit einer langsamen Einleitung. Nach einem langsam kräuselnden Kontrapunkt und zunehmend drängenden Fanfaren erklingt in den hohen Streichern zweimal ätherisch ein aufsteigendes Sechstonmotiv, das als „Dresdner Amen“ bekannt ist. Es gibt Meinungen, die behaupten, dies sei ein Bezug auf die katholische Liturgie und verweise auf die von Kontroversen zerrüttete alte Kirche. Tatsächlich beginnt der geschäftig einsetzende Hauptteil des Satzes—nun in Moll—sofort mit einem Gefühl von Kampf und Tumult. Am Ende des zentralen Durchführungsabschnitts kehrt das „Dresdner Amen“ zurück und leitet diesmal eine Reprise ein, die gedämpft beginnt, aber erneut auf einen stürmischen Höhepunkt zusteuert. Das Scherzo ist anmutig und heiter, und seine Stimmung scheint sich vom Rest der Sinfonie abzuheben (sie ist eher bukolisch als ehrfurchtsvoll). Das Scherzo bleibt jedoch durch thematische Bezüge zu den absteigenden Holzbläsermotiven vom Anfang eingebunden. Der feierliche dritte Satz ist kurz. Das Gefühl, dieser Satz wäre zumindest teilweise als Einleitung zum Schlusssatz konzipiert worden, wird durch die an ein Rezitativ mahnende Violinlinie noch verstärkt. Der Schlusssatz beginnt mit einer warm harmonisierten Darbietung von Ein feste Burg ist unser Gott. Diese Darbietung bildet das Vorspiel zu einem Sonatenhauptsatz mit eigenen Themen, in den gelegentlich der Choral eingeschoben wird. Der letzte Auftritt des Chorals bringt das Werk zu einem prächtigen Abschluss. Mendelssohns außergewöhnlich frühes Komponieren—mit nur 16 Jahren konnte er schon auf zwölf Streichersinfonien, sechs Opern, das erstaunliche Streicheroktett und noch vieles mehr verweisen—ging Hand in Hand mit einer kulturellen Erziehung, die ihn für literarische und bildnerische Angelegenheiten gut rüstete. Neben seinen musikalischen Aktivitäten schrieb Felix Gedichte, malte und zeichnete. Das Heim seiner Eltern gehörte zu den aktivsten intellektuellen Salons in Deutschland, wo häufig Konzerte, Theateraufführungen und literarische Lesungen stattfanden. Hier gaben sich Wissenschaftler, Philosophen, Schauspieler, Schriftsteller und Musiker die Hand. Felix fand in diesen Erlebnissen viel Anregung, und im Sommer 1826, als er immer noch nur 17 Jahre alt war, fühlte er sich veranlasst, eine Ouvertüre auf Shakespeares märchenhafte Komödie A Midsummer Night’s Dream [„Ein Sommernachtstraum“] zu komponieren. Die Ouvertüre lässt sich entsprechend ihres ursprünglichen Konzepts besser als eine Tondichtung beschreiben: Sie entstand nicht als Einleitung zu einer Aufführung des Theaterstücks. Im Rahmen einer Sonatenform stellte Mendelssohn wie erwartet—auch wenn die kompositorische Umsetzung alle Erwartungen übertraf—deutlich die Elfen, den selbstbewussten und weltmännischen Hof von Theseus, die sich sehnenden Liebenden im Wald sowie die ungehobelte Art der „rüpelhaften Handwerker“ einschließlich Bottoms Eselsrufe dar. Artikuliert wird das Werk auch von den wiederkehrenden vier Akkorden aus den einleitenden Takten. In entscheidenden Momenten senken sich diese Akkorde auf die Musik und verwandeln ihre Stimmung wie durch einen Zauberspruch. Mendelssohns Ouvertüre wurde im April 1827 in Stettin uraufgeführt und zählte bald zu den beliebtesten Stücken des Komponisten. 1842 erhielt Mendelssohn vom preußischen König den Auftrag, die Bühnenmusik für eine Inszenierung des Theaterstücks zu liefern, vor der die Ouvertüre erklingen sollte. Mendelssohn folgte der Aufforderung und schrieb Lieder, Zwischenspiele und verschiedene andere kleine Nummern. Die vollständige Partitur war zum ersten Mal im Oktober 1843 in Potsdam zu hören. Die hier vorliegende Einspielung konzentriert sich auf die Musik für die Welt der Elfen und menschlichen Liebhaber. Diese Fassung wurde von Sir John Eliot Gardiner und dem London Symphony Orchestra für Aufführungen in London und Deutschland als Teil der Feierlichkeiten zu Shakespeares 400. Todestag zusammengestellt. Erstaunlich, wie Mendelssohn anscheinend keine Schwierigkeiten hatte, an die Stimmung aus seinem 16 Jahre zuvor komponierten jugendlichen Meisterwerk anzuknüpfen. Das wird besonders am Beispiel des Scherzos deutlich, das sich, auch wenn es vielleicht ein wenig derber (möglicherweise sogar unheimlicher) ist, in der gleichen Welt bewegt wie die Elfenmusik aus der Ouvertüre. An anderer Stelle bietet das Intermezzo eine an Schumann mahnende Darstellung des Gefühlsaufruhrs der im Wald verirrten Liebenden. Das Notturno wiederum heißt Pucks zauberhafte Korrektur der nächtlichen Irrungen und Missverständnisse willkommen. Zwei Elfen bereiten in einem Lied mit Chor das Gemach für Titanias Schlaf vor, und die Hochzeit von Theseus und Hippolyta wird in dem berühmtesten Hochzeitsmarsch aller Zeiten gefeiert.